The differences between those who are “pro-life” and those who are “pro-choice” has caused a political, societal and social wedge between anyone and everyone with an opinion on this hot button topic. What many people don’t realize however is that although this is often a topic of conversation, it is also something that affects the decisions of women worldwide regarding their civil liberties once they find out they are pregnant. In a day and age with so many lines drawn separating people politically, there is always a grey area left to be examined. There is often so much pressure to choose a side, political party, or particular stance on an issue, that people don’t really give themselves the opportunity to think “what if this decision arose in my own life or the life of someone close to me?” It is often only when this point of contention arises in our own life that we truly get the chance to see ALL the options. While it seems almost everyone has an opinion about whether abortion is morally correct or not, it is generally accepted that legally the fate of a fetus rests in the hands of the woman carrying the child. It is the mission of many women’s health organizations not to impress their beliefs on mothers but simply to educate them about their options. So what are these options? Aside from the controversial issues that lie on the outskirts of this debate such as genetic birth defects, time sensitive termination, or abortion as a civil liberty after sexual abuse, there are two main options usually presented. The first being to choose parenting, whether a woman is pro-life politically, pro-life for religious reasons, or is simply choosing as an individual to carry her pregnancy to full term. Many women find this prospect overwhelming, especially if they feel they don’t have the means to support a child or the pregnancy wasn’t initially planned. The second is to terminate, or induce miscarriage through abortion. Each woman is in a unique position when faced with making a life altering decision. We all come from different walks of life and circumstances and when politics can be taken out of this debate, it is up to each woman to make a choice. In that sense, pro-life and pro-choice opinions aren’t that different after all. In any pregnancy a woman is faced with choices along the way, right down to finding out the gender of their future child. People so often get caught up in the idealism of picking a side and thinking about a fetus in terms of black or white, to keep a child or to terminate a pregnancy. It is imperative that we as women realize that there are other options besides just the two spoken about politically by men and women alike. Choosing the path of adoption adds a facet to this decision that many women don’t consider, whether it be because they simply aren’t aware of it, fear giving up their child, not wanting to be pregnant for nine months and so many more circumstances that come into play. 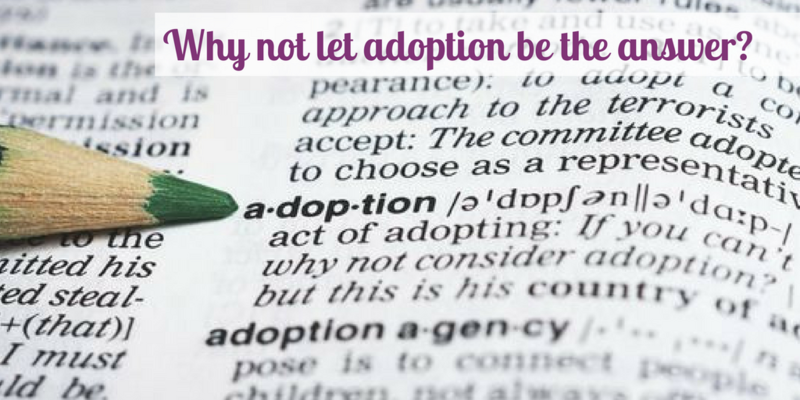 The important part is that adoption is a third option, one not so much dominated by political agendas as much as it is a very personal and emotional choice for the individual faced with the decision. Choosing adoption is also one of those life moments that draws parallels between opposing viewpoints, pro-choice and pro-life. Adoption allows for human life without the parenting aspect and allows for a woman to use her legal right to choose the destiny of her future offspring. What if there was another choice? It is so easy to depersonalize these dilemmas from a political standpoint but many birth mothers describe this as being the most personal decision they have ever had to make. Choosing to give up your right to parenthood is not a decision to be taken lightly, but it is certainly a brave one. So many women in this world wish everyday to conceive a child they can raise so how could a mother give up that opportunity? Is this a selfish choice or the most selfless choice? It depends who you ask, but birthmothers alike agree that it is a difficult and deeply personal process. While many may see it as giving up the gift of having a child, it can also be seen as giving a gift to a woman who could not conceive herself. It takes so much bravery and strength to make a decision that will affect a child for their entire life. Again, everyone seems to have some sort of opinion on all three of the choices women have, at the end of the day choosing adoption is a decision made by one person, affecting the lives of many, however positive or negative that may be. This third decision provides a way to take out some of the political and societal issues surrounding abortion vs parenting. It provides women with a way to turn unplanned pregnancy into something positive. So many things that seem black and white at first give way to grey area through education and understanding. As a society, the adoption industry has become highly evolved, allowing birth mothers to spend months planning, often having the opportunity to choose the people adopting their baby. It also provides resources for birth mothers in dealing with them before, during and after pieces of the whole process. The steps have become comprehensive in caring for both birth mother, child and adoptive family’s physical, emotional and future well-being. Often birth mothers describe themselves as lucky or blessed because giving their baby up for adoption, while probably the most difficult decision they’ll ever have to make in their life, was a way out of choosing to either terminate an unplanned pregnancy or parenting when the birth mother’s situation may not necessarily be ideal to bring a child into. In that sense, adoption as another option is so important to educate today’s women on. While many birth mothers deal with guilt and heartache after making their decision, many come to say that at the end of the day both they and their child are better off than the decision strictly coming down to termination or raising a child.